The E8663B analog signal generator provides lowest close-to-carrier phase noise of the industry available in an off-the-shelf signal generator. 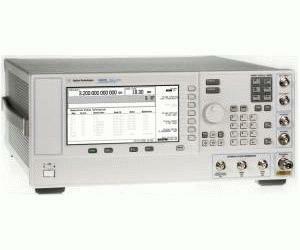 With included analog modulation (AM, FM, ØM, and pulse) capability, superior level accuracy and high output power, the E8663B is the right choice for demanding applications such as radar system development, satellite communications evaluation, or when a very low noise local oscillator or reference signal is needed. Built on the outstanding legacy of the 8663A, the E8663B delivers improved performance and is fully code compatible with its predecessor for seamless upgrades to existing test systems. Enhanced narrow pulse modulation and extended support life are optionally available.